Healthcare leaders generally prefer Senate Republicans' tax bill released Thursday over the House GOP tax cut plan released last week. But they have strong objections to a number of provisions in both bills and are likely to lobby hard for changes. They are particularly concerned about measures to limit tax-exempt financing for not-for-profit organizations, restrict deductions for interest payments, impose an added tax on compensation for high-earning executives, and put a levy on university endowments. On the other hand, they're pleased that the Senate bill, like the House bill, so far does not include a repeal of the Affordable Care Act's tax penalty on individuals for not buying health insurance. GOP leaders continue to eye several possible additions to the bill, including repealing the mandate in their tax package, because it would give them an estimated $338 billion in savings over 10 years that they could use for bigger tax cuts. But the Congressional Budget Office said Wednesday that abolishing the mandate would lead to 13 million more uninsured Americans and drive up individual-market premiums by an average of 10% a year over the next 10 years. "We think the mandate is an important component of the overall health insurance system, to make sure coverage remains affordable and more people remain insured," said Karen Fisher, chief public policy officer for the Association of American Medical Colleges, which also represents major teaching hospitals. A key difference between the Senate and House bills is that the Senate version preserves tax-exempt municipal bond financing for capital projects undertaken by not-for-profit hospitals and other qualifying not-for-profit organizations. The House projected that eliminating this tax exemption would save the government $40 billion over 10 years. According to the Merritt Research Services, outstanding end-of-year hospital debt totaled nearly $301 billion in long-term bonds and nearly $21 billion in short-term debt. Nearly all of that debt was issued as tax-exempt bonds. If the tax exemption were eliminated, as House Republicans have proposed, hospitals would have to pay interest rates that were 0.25% to 0.5% higher than in the current marketplace, said John Cheney, managing director Ponder & Co., who advises organizations on raising debt capital. That's because bond investors would demand higher interest rates in lieu of receiving the interest income free of federal taxes. But the Senate bill, like the House bill, would prohibit advance re-funding of prior tax-exempt bond issues. That still would hurt hospital borrowing, because advance re-funding bonds made up about 25% of the municipal tax-exempt bond market in 2017, according to Cheney. "This will make projects more expensive, and if hospitals have a higher cost of doing business, the users of hospital services will have to pay more," he said. "Tax-exempt financing is critical to ensure capital funding for all three of our institutions' missions of clinical care, education, and research," Fisher said. Both the Senate and House bills would slash the corporate tax rate from 35% to 20%, which could benefit profitable healthcare companies like UnitedHealth Group, HCA and Universal Health Services. And both would reduce the tax rates for high-earning individuals, like healthcare executives, and eliminate the alternative minimum tax. Both bills would cap corporate interest deductions at 30% of earnings before interest, taxes, depreciation, and amortization. That could hurt companies carrying large debt loads such as Tenet Healthcare Corp. and Community Health Systems. Beyond the immediate tax impact, analysts cautioned that healthcare companies should beware of big cuts in Medicare, Medicaid and Affordable Care Act funding that Congress may consider to offset the revenue losses from the bill's tax cuts. The House and Senate budget resolutions capped the 10-year cost of the tax cut package at $1.5 trillion. "We're always concerned that people look to entitlement programs, particularly Medicare, as a source of dealing with the deficit," Fisher said. The Senate Finance Committee has scheduled a markup for Monday of the 253-page Tax Cuts and Jobs Act, though no hearings featuring expert testimony are planned. The House Ways and Means Committee approved its version of the tax cut bill on a straight party line vote Thursday, also without holding hearings with expert testimony. "The Senate proposal benefits Main Street businesses and modernizes the tax system in a way that will shift our economic landscape to make America a more inviting place for businesses to invest, keeping jobs from being shipped overseas," Senate Finance Committee chairman Orrin Hatch (R-Utah), said in a written statement accompanying the bill's release. 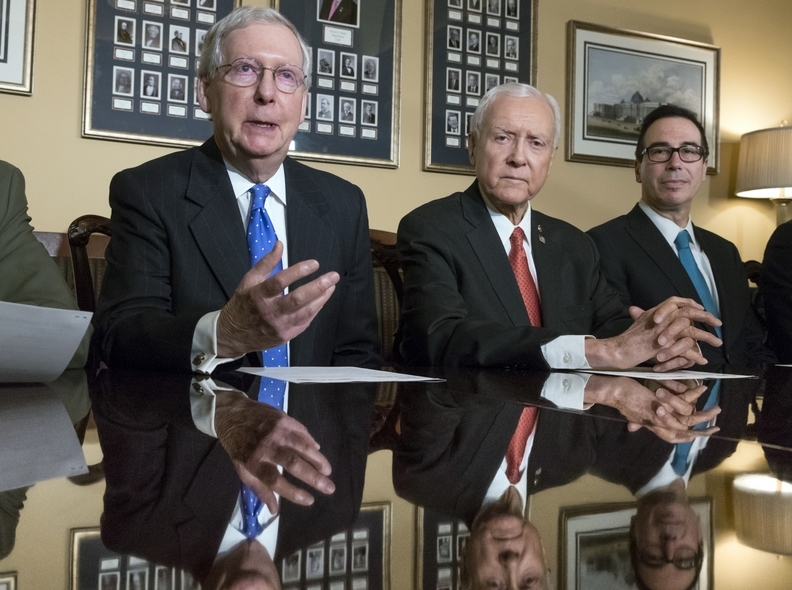 Republican leaders are aiming to pass their tax cut legislation before the end of the year through the expedited budget reconciliation process, which would enable them to do so on a straight party-line vote in the Senate, with no Democratic support. Few, if any, Democrats are expected to vote for the legislation. But to pass through the budget reconciliation process, the legislation cannot exceed the GOP's self-imposed cap of increasing the deficit by $1.5 trillion over 10 years, and it cannot increase the deficit beyond 10 years. That will require difficult horse-trading between House and Senate Republicans, and between Republican constituencies that may be winners or losers under the legislation. One provision that universities and academic health centers want to change in both the Senate and House bills is a proposed new excise tax on annual investment earnings of larger private university endowments. It is projected to raise $2 billion to $3 billion a year over 10 years. Critics say universities are holding billions in endowment funds that should be used to lower tuition. But the AAMC's Fisher said that endowment income enables institutions to provide a lot of activities that benefit their missions to the communities they serve. Her group, however, welcomed the Senate's preservation of the current tax-free tuition waivers and student loan interest deductions, which she said are important for medical students and residents. Those tax breaks would be eliminated under the House bill. Healthcare organizations also were pleased that the Senate bill, unlike the House bill, preserved the tax deduction for households with high medical expenses, including long-term care costs. That deduction costs the Treasury about $10 billion a year. The AAMC, the American Hospital Association and other healthcare organizations are opposed to provisions in both the Senate and House bills that would impose a 20% excise tax on executive compensation exceeding $1 million a year. Fisher said that doesn't take into account that many academic center leaders are practicing physicians.